As a new patient Dr. Atiemo was very professional and knowledgeable and help ease my mind regarding getting a knee replacement. Dr Atiemo explained and gave me all the tools l needed to make decisions regarding my care options. He listened tomy chief complaint and suggested the best treatment options for me. Dr Atiemo explained and gave me all the tools l needed to make decisions regarding my care options. He listened to my chief complaint and suggested the best treatment options forme. 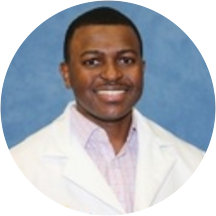 Emmanuel Atiemo is a concerned and diligent orthopedic surgeon in Leonardtown, MD. Dr. Atiemo obtained his medical degree from the Morehouse School of Medicine. He completed his internship and residency in orthopedic surgery at Temple University Hospital. He then finished his fellowship at MedStar Union Memorial Hospital. Dr. Atiemo is a part of MedStar Orthopaedic Institute. He sees patients for orthopedic consultations, as well as other common and specialized reasons. During his consultations, Dr. Atiemo fully explains patients’ conditions and helps them choose an appropriate treatment plan. Dr. Atiemo is devoted to ensuring the longevity of his patients’ health and developing long-lasting relationships with them. He takes his time to understand symptoms and give correct diagnoses to ensure the continued health of all his patients. It was very nice meeting Dr. Atiemo. He told me what was wrong with my back and why I had the terrible pain and what needed to be done to help me. Very good bedside manners. He listens and does notrush you. I will be seeing him again in 2 weeks. Dr. Atiemo provided an excellent explanation of what the orthopedic issues was, had a visual model to show the issue and provided a plan forward. He was not hurried and made sure that we were satisfied with his explanation and prognosis. The doctor actually exam my foot with his hands. Rarely for many. I was impressed. He got right down to the problem. Thank god. Many doctors are afraid to touch patients they usually just conversate. He example my issues and problemsfor necessary healing and re evaluation I was extremely happy with the treatment I received today. The office staff was courteous and friendly; I maybe waited 10 minutes after I arrived (I was early) and soup-to-nuts, I was there 30 minutes. He had already reviewed films & MRI data - came in and talked to me, didan exam and we discussed options and a path forward. He and his staff are easy to talk to and put you at ease right away. Extremely pleased with the entire experience! Dr. Atiemo and his staff were wonderful. He was very patient and kind to my daughter and took the time to listen and even discuss her case with colleagues to ensure great treatment!